Yuan Changying (袁昌英, 11 October 1894–28 April 1973), a playwright, novelist, scholar of literature and feminist in China, was the first Chinese female graduate in Edinburgh University’s history, as well as the first Chinese female Masters student in British history. Yuan was once known as “a peacock flying out of Edinburgh” because of her later influence in literature and feminist movement in China and, in particular, one of her famous dramas, “Southeast Flies the Peacock” (Changhua, 2009). She studied at the University of Edinburgh from 1917 to 1921, earning a Master of Arts with a thesis on Shakespeare’s The Tragedy of Hamlet. Let us get close to the life, thought and courage of Yuan Changying and the influence Edinburgh had on her. Yuan Changying was born in Liling, Hunan Province in China, on 11 October 1894, when China was going through a period of national turmoil. Her father, Yuan Jiapu, studied at Waseda University in Japan, and Yuan was brought up in a relatively well-off family. Unusually for a girl, she enrolled in an old-style private school in her hometown of Liling, and later travelled a lot, learning as she moved from one place to another. In Jiangxi, Changsha, Shanghai, Beijing, Yunnan, she was fortunate enough to receive education of different kinds. 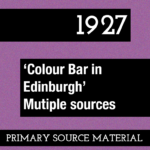 Yuan started to learn English in 1912, when she was 18, which paved the way of her coming to Edinburgh. In 1916, Yuan was admitted to Black Health High School in London. She entered Edinburgh University the next year. Yuan spent four years at the university, studying drama in the Faculty of Arts. In Edinburgh, she indulged in the world of performing arts. More than that, she was deeply concerned about social reality in China, especially education, women rights and broadly social reform in the Chinese context. Yuan first met her future husband, Yang Duanliu (杨端六), during one of her visits to London, and her study of drama at Edinburgh exerted considerable influence on her career as a scholar and playwright, when she returned to China after 1921. During her time in Edinburgh, Yuan Changying wrote two essays which were both sent back to Shanghai and published in The Pacific, a journal launched by a group of Chinese graduates. They told of her experiences studying overseas – the cost of living in Edinburgh, the challenges of reconciling Chinese and Western lifestyles, the practicalities of balancing academic and social life, the importance of holding on to a “reasonable” kind of nationalism – and outlined her early thoughts on gender equality. The first essay, written in 1920, was a letter sent to a friend in Shanghai titled “On Co-education in Higher Education” (Changying, 1920a). In it, Yuan described the relative equality between men and women in Europe and North America, and stressed that China should be aware of, and follow, this trend. She argued that women should have the equal right to receive education like men, which would be the first step towards gender equality: “Knowledge is Power,” she wrote, invoking Francis Bacon’s famous axiom. Yuan contended that, although there was a women’s college in Nanjing, women’s access to higher education in China was still severely limited. Refuting the traditional view that a virtuous woman was a woman who had no knowledge or literary talent, she saw co-education (in other words letting women attend colleges occupied by men) as a solution to the problem. A reformist and a moderniser, she argued that men and women should directly communicate with one another, and learn together. Relating to the national turmoil during that period, Yuan claimed that to achieve an integrated nation, the female is the half. After graduating from Edinburgh, Yuan became a scholar, writer, and social activist back in China. She is remembered mainly as the author of “Southeast Flies the Peacock”, a dramatic adaptation of an old Han ballad of the same name. The original story tells of the tragic life of a young woman who fails to satisfy her mother-in-law, is separated sent back home, refuses to remarry and finally commits suicide with her husband. The emphasis of critiques before was put on the mother-in-law who was feted by the ethics in Chinese traditional family shaped by Confucianism. Drawing the attention from the victimised daughter-in-law to the mother-in-law in the story, Yuan’s drama claims the mother-in-law was “herself a victim of the system which prohibits remarriage for women and disregards the sexual and emotional needs widows” (McDougal & Louie 1997). Yuan felt there was a systemic problem in Chinese society in which Chinese women were oppressed. She believed they had been oppressed for centuries. She condemned this, arguing for the equality between men and women. Her efforts exerted a considerable influence in changing the lives of thousands of Chinese women in the coming generations. 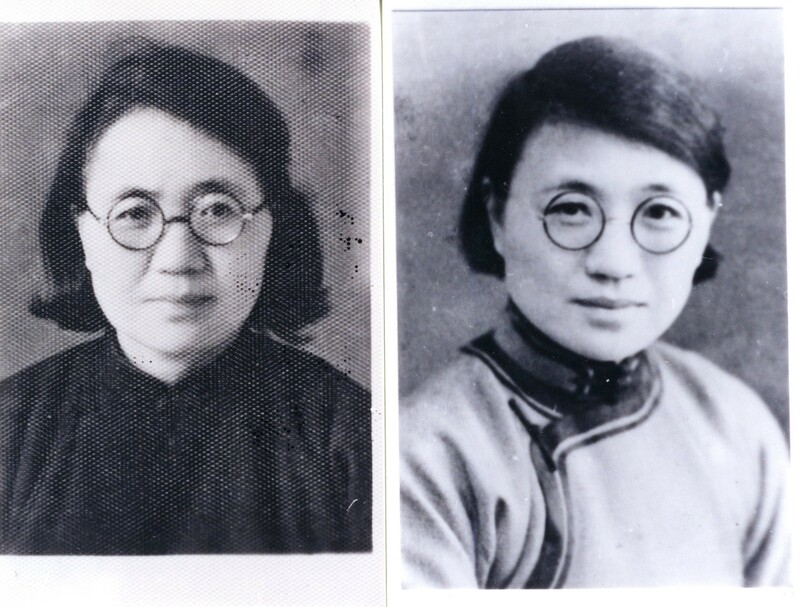 Upon the recommendations of the politicians and intellectuals Wang Shijie and Zhou Gengsheng (who was also a graduate of Edinburgh University), Yuan started to teach in Beijing Normal Women’s college in 1922. She returned to the Europe again to study in the Higher Research Institute based in Paris University in 1926. Later, she held the position of professor of Western Literature at Wuhan University. With two other female writers, Su Xuelin and Ling Shuhua, Yuan Changying was named as one of “Three Heroines of Luojia.” (Luojia hill is located in the campus of Wuhan University). After 1949 when the People’s Republic of China was founded, Yuan became a member of Chinese Democratic League. Unfortunately, during the Anti-right movement since the 1950s, she was persecuted as being labelled as the rightist, a member of the right-wing. In the Cultural Revolution from 1966 to 1976, Chinese communist oppression of intellectuals still continued and she was expelled from Wuhan back to her hometown. Yuan’s life ended in her birth place of Liling in 1973. Changyin, Y, 1920a, ‘On Coeducation in Higher Education’ [Daxue nanu tongxiao shuo] The Pacific, 5, 1-2. Changyin, Y, 1920b, ‘On the Necessity of Women Studying abroad’ Lun nuzi liuxue de biyao] The Pacific, 8, 1-8. McDougal, B.S. & Louie, K, 1997, The Literature of China in Twentieth Century, Hurst & Company, London, pp.174-175. 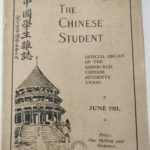 OLDER1921 – The Chinese Student – the “Official Organ of the Edinburgh Chinese Students’ Union” – is launched.